It probably says something about me that I seem to identify more with my characters when they're being cynical and/or misanthropic, but I do feel a strong connection to Justin in panel one. Of course, part of the reason I feel that connection is because he's also chastising himself for approving of unnecessary violence. ...Huh. I actually wanted to link to an example of Susan being cynical and/or misanthropic in a manner that makes me identify with her more, but the best examples I can think of just now are ones where I identify with her less... I guess it depends on how empty or full their cups were to begin with. Eh, whatever. Have a link to the moment of ultimate Susan rage instead. I'm not sure I made Justin unusually large enough relative to Rhoda in the last panel. 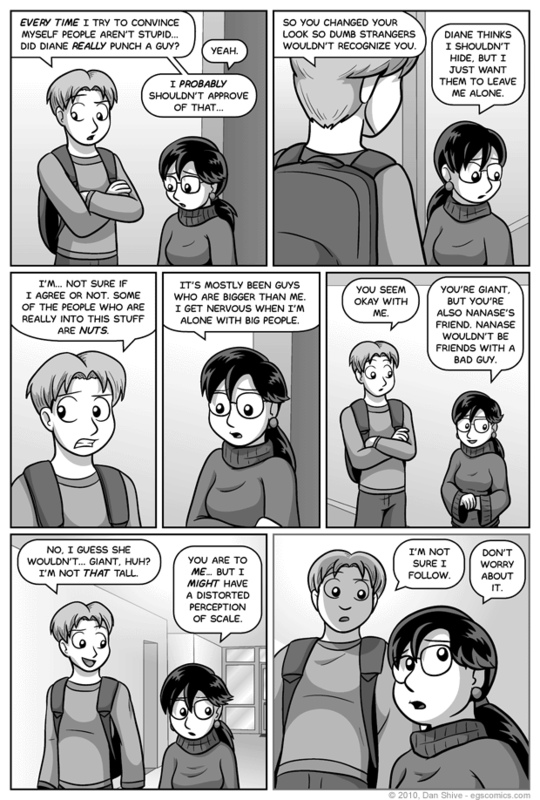 Justin's already a foot taller than Rhoda (6' to Rhoda's 5'), and while Justin is relatively larger in that panel than the others, it's harder to tell from an upward angle. I originally had a downward angle that made the size difference change REALLY obvious, but it seemed weird having a downward angle when the whole thing is supposed to be as close possible to Rhoda's own perspective while still showing Rhoda. The idea that Rhoda feels even smaller than she actually is is partially inspired by the simple fact that my own perception of the scale of things relative to myself tends to fluctuate. Put another way, my surroundings (open space, objects, people, animals) might seem bigger to me one day than they did the previous day. It's difficult to explain why they seem bigger or smaller, but they just feel like they are. Not by a lot, but obviously enough that I notice it. One hypothesis I have as to why this happens is simple relativity. Spending enough time in a small room will make a medium sized room feel bigger by comparison, and spending time in a big room could make that same medium sized room feel smaller. That doesn't really explain how it basically applies to the whole world or why everything suddenly seemed much smaller to me the other day. I was so taken aback by the change in my perception that I had to sit down for a bit, observe my surroundings and just muse on it for a while. I'm not sure if my perception is back to normal now or if I just got used to everything feeling smaller. And before anyone asks, no, I don't eat strange mushrooms. In any case, that's the sort of thing that got me thinking about the possibility of someone always feeling bigger or smaller than they really are. I'm honestly not sure if this is possible, but the idea intrigued me and the comic already has a shapeshifting squirrel girl with four parents, so it's a bit late to be worrying about what does and doesn't fully match up with reality.